A huge thanks to Sylvain of Your Lovely Places for asking about my favourite places. 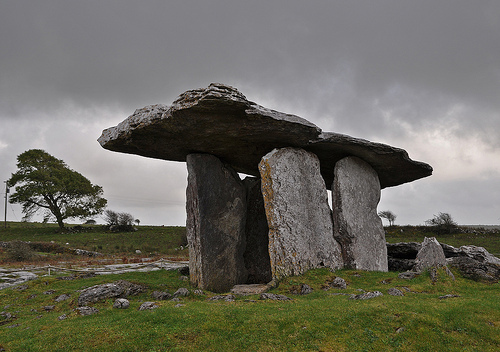 Among Celts, Samhain celebrated the end of summer, the harvest and the dead. Samhain was time to take stock of the herds and grain supplies, to decide which animals would need to be slaughtered, with the bones of slaughtered animals being thrown on huge fires (thought to be the origin of the word bonfire, from bone-fire). 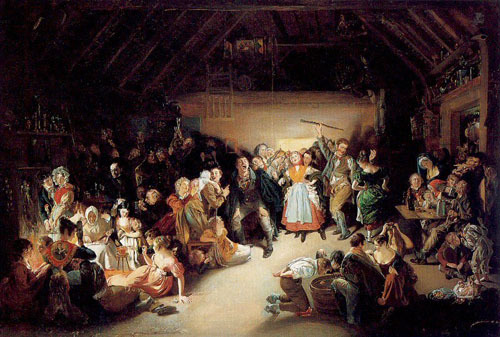 Like many pagan feasts, this thanksgiving-like festival was later absorbed by the church and became "All Hallows' Day". The evening before, All Hallows' Even, is what we now know as Halloween. Love this dress and look from Haute Hippie, via Shopbop. Nothing makes me smile quite like a donkey. Aren't they awesome? And isn't this cute? 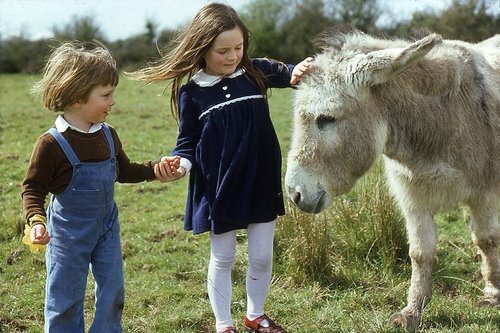 Adopt one here (a donkey, not a kid). Image from Nasher's Flickr, here. I know I've blogged about this label before, but I still love her lingerie. I own some and it's pretty much as divine as it looks. More here. 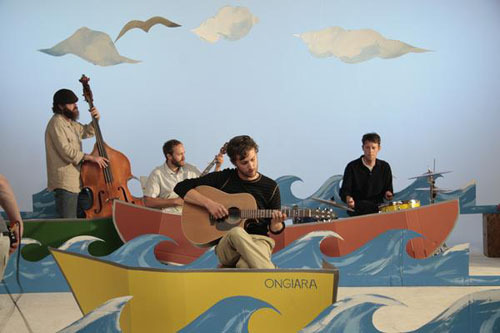 While I write, I'm listening to Great Lake Swimmers. My favourite, by you guessed who... But, I really do find it (and him) uplifting. Manoush makes me think of Amelie, though I know she wore nothing like these outfits in the movie. Maybe it's just the sweet model or the brilliant colours, but I find the whole collection disarming in that Amelie-like way. Some people have such impeccable taste that just a hint of a recommendation is enough to sell something. My friend Natasha is top of that list. She e-mailed me today about DayNa Decker candles and I just know I'll be smitten. Question is, can anything knock Jo Malone off Janey's pedestal? Maje is a new label to me. Chic, no? This is an internet love moment. 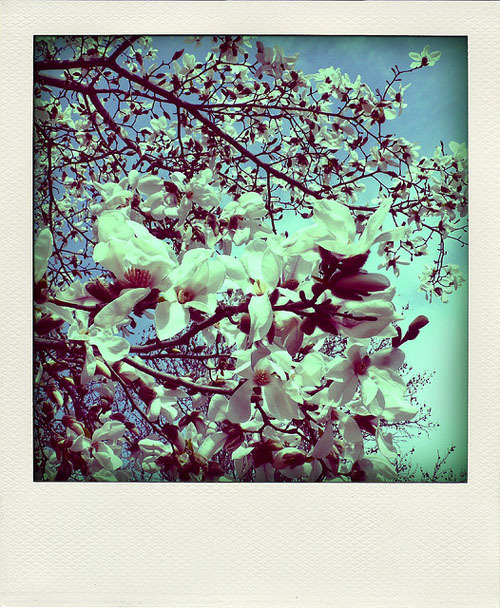 The Poladroid takes any image from your computer and transforms it into a Polaroid-like image. It's a cinch to use, is madly addictive and the results are awesome. 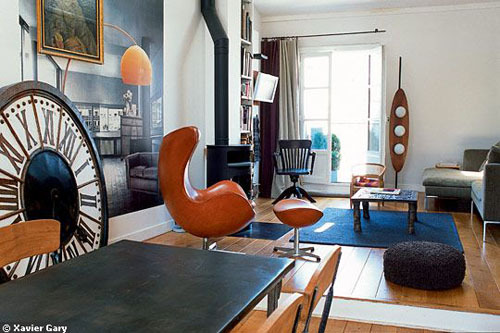 I love the egg chair in this setting. I hate that it costs a gazillion dollars. And, yes, I still want one. Image from Cote Maison, photographed by Xavier Gary. 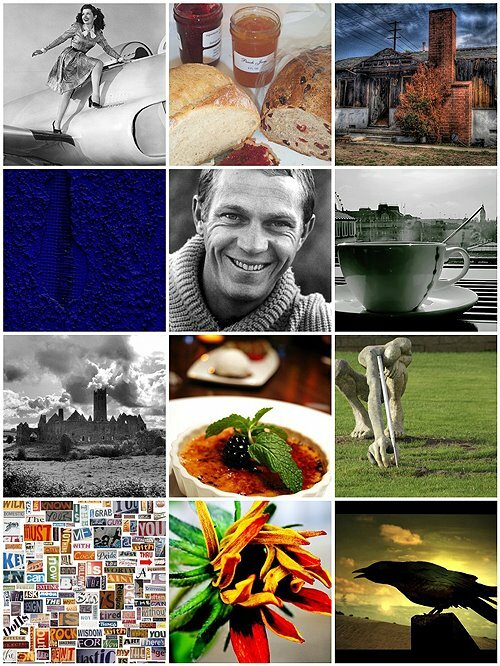 Some of my Flickr faves. They match my pensive mood this evening. I would live here. 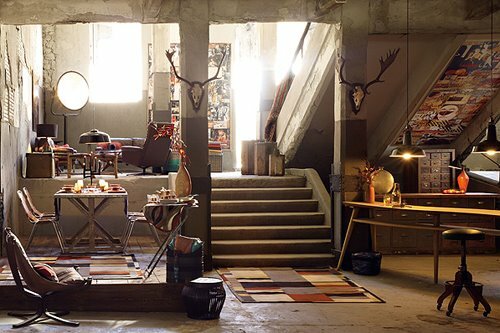 And it would never occur to me that I was living in a Zara Home catalogue. Even after you showed me it, I would barely believe it. It kindof reminds me of Sabine's place in Unbearable Lightness of Being. I love that movie. I've been listening to The Acorn a lot today. 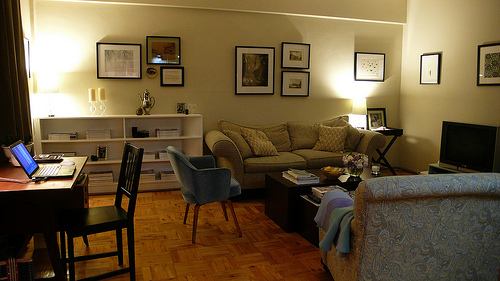 So, when I hung all my artwork, I had one glaring spot left empty. And I knew I wanted something special for it. Everything I hang on my walls has to move me at some level, whether it's connected to me directly or a place I love or just expresses something that moves me at a gut level. So, I commissioned a piece from Shannon Rankin. 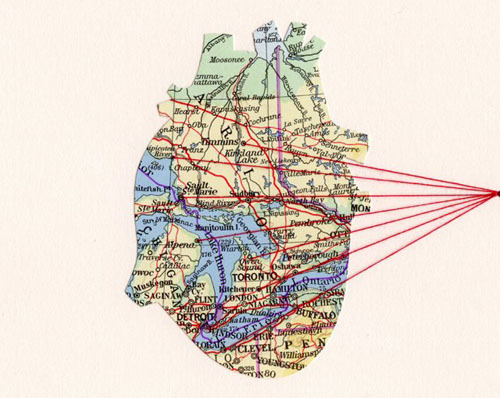 The two hearts are made out of maps. 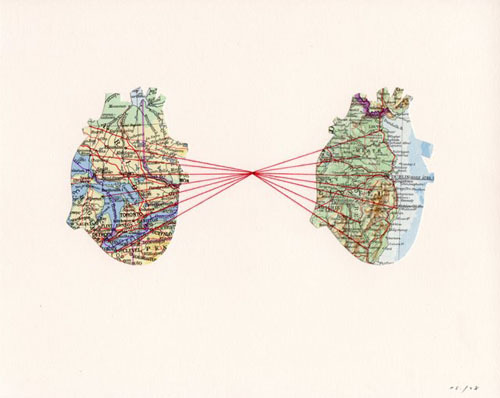 One map is of Ireland (Dublin), the other Ontario (Toronto). 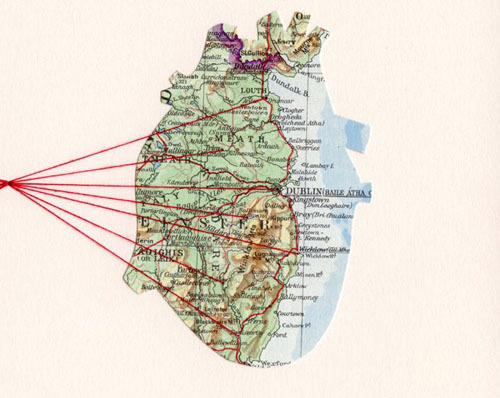 Shannon magically chose towns in Ireland that I love to connect the thread from. 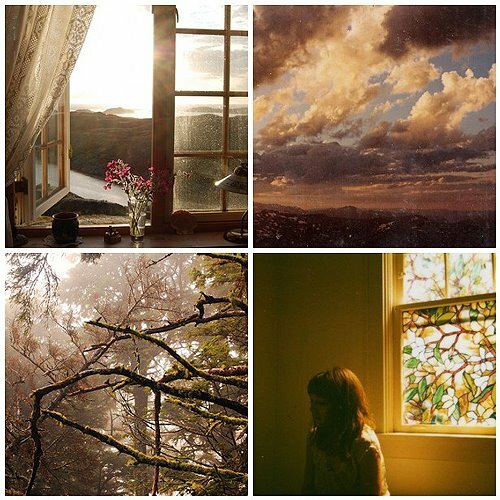 Tonight, she sent me these images tonight for approval and I didn't hesitate a second. It's 100% perfect and she was just a joy to work with! 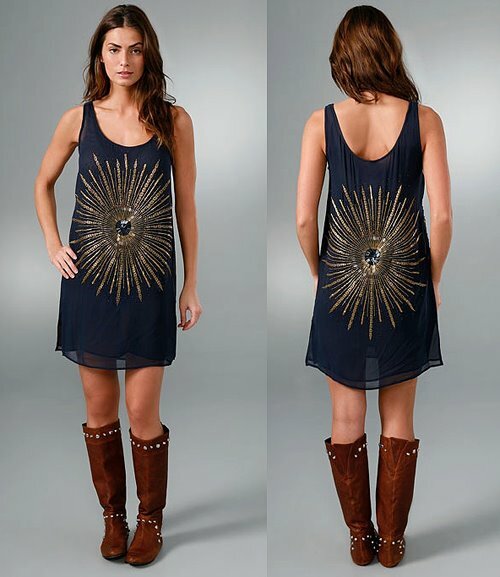 I want this dress from Toast so bad. I love the tights and boots too. And this one too for Christmas parties. They're very different, but I'd wear 'em both to death. 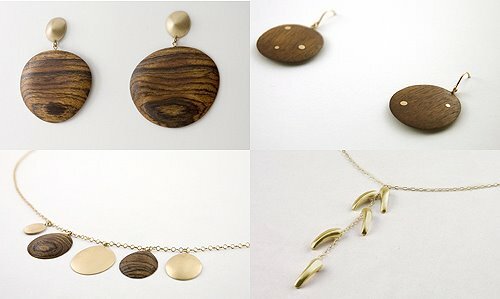 I typically fall for jewelry with wood accents, so it was love at first sight with these pieces by Marion Cage, especially given their unusual delicacy. 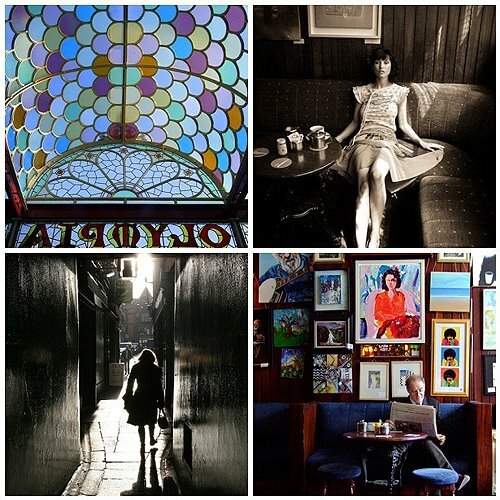 I've blogged before about Dee Puddy, a sweet little site from the UK. 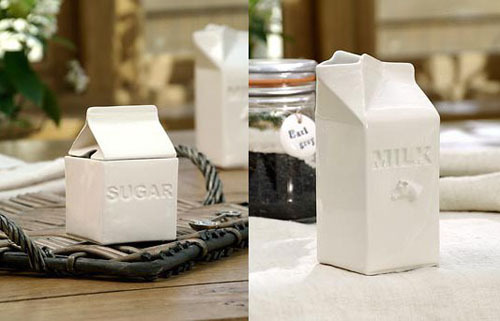 I like these porcelain cartons a lot. 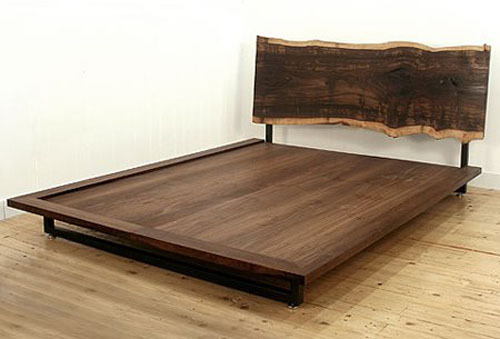 If I could afford this, it would be mine in an instant. From Uhuru. Toronto just got its first Crate & Barrel and West Elm. But, I'm really, really excited about this news. Yes, my ladies, we're getting an Anthropologie. Right in Yorkville. I'm sooo excited! J. Crew & Room & Board are also on my wishlist (in case anyone's listening). You? Stores you want in your town that you don't have? Jenny Yoo's dresses are perfect. I mean it. Utter perfection. Yesterday, I rehung all my pictures! 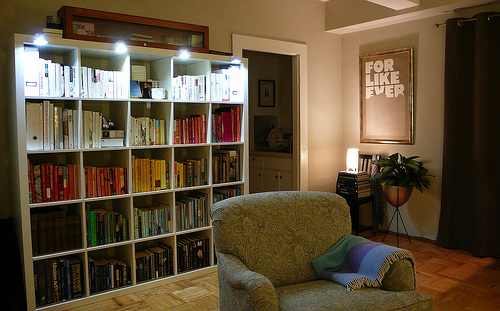 Here are the results, which more or less gives you a 360 of my living room. I couldn't bring myself to fluff, felt too phony, so 'scuse the dying flowers and lumpy looking sofa (which is lumpy because I love it a little too much). When I look over from my desk I see the John Derian eye staring back at me. But not in a creepy way. 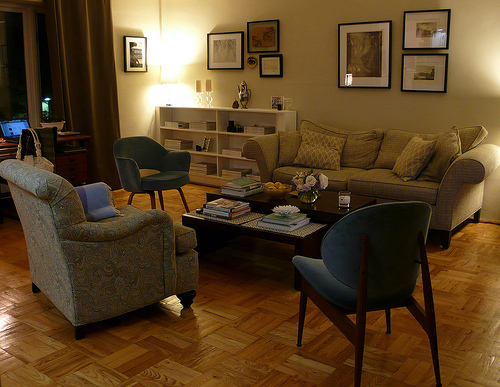 I think I need a rug, but I find it hard to decide upon one and love the ease of keeping my floors clean. Oh, and I want a Bertoia chair for my desk. 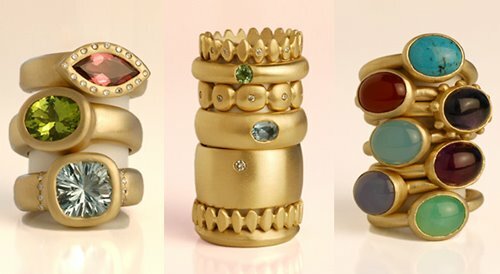 Love, love the jewelry, and in particular the rings, from Eles Designs by Toronto-based Laura Serrafero. I took a stroll today and shot some pictures of trees. And stood for a while beneath my willow tree, which in no way is mine. And I know anthropomorphizing nature is a strange thing to do. But, it feels like such a friendly willow. All the dappled light had me reciting in my head this poem we learned in school. Which goes to show, more than 20 years later, you can't beat a nun determined to implant poetry in a young mind. Sr. Nuala, I wonder if you even dared hope this would get stuck? And I wonder would you be upset that I took away the poem, but not the theology? Hello, pretty girl! I do so like your jacket. From J. Crew Collection. 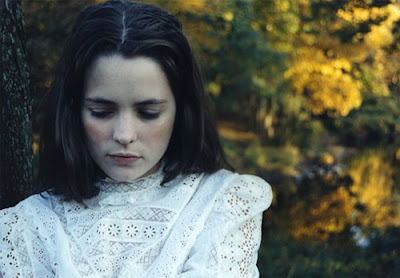 Minna Hepburn makes beautiful tops and dresses from Scottish lace and organic Fairtrade cotton. Wouldn't these make sweet wedding dresses? I was skulking around the McSweeney's site and saw this book. 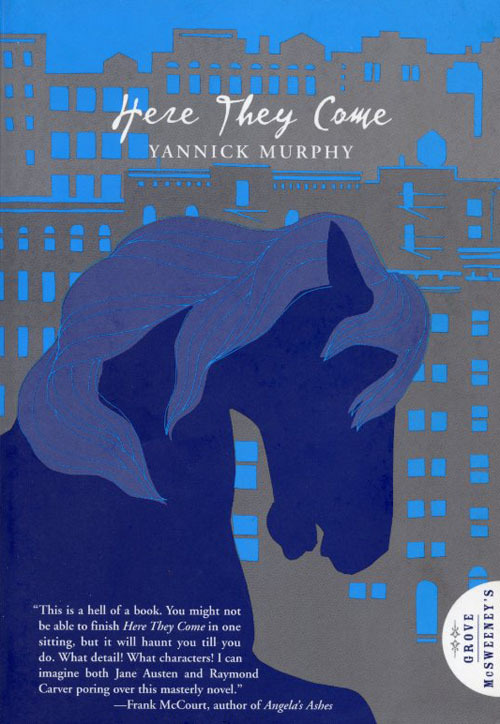 It's the first I've read by Yannick Murphy. The story is set in 1970's New York and told, Tractatus-style (minus the numbering) by a young teenage girl. Fragmented like memories or perception, the parts do cohere into a whole and the story arcs beautifully and gently. When I finish a book I've loved, I find it hard to physically put it down. I usually hold it in my hands for a few moments, touching the cover, not yet ready to put it on the shelf and move on. When you're surrounded by people with obvious talent, it can be too easy to assume they know they've got it, to be more focused on your own insecurity and wish to impress. But everyone needs to hear it and has those moments of self doubt. In the book, Remembering Beckett, Paul Auster tells the story of the first time he met Samuel Beckett circa 1973 (he can't remember the exact year). This is an excerpt. This was Samuel Beckett, remember, and not even he had any grasp of the value of his work. No writer ever knows, not even the best ones. 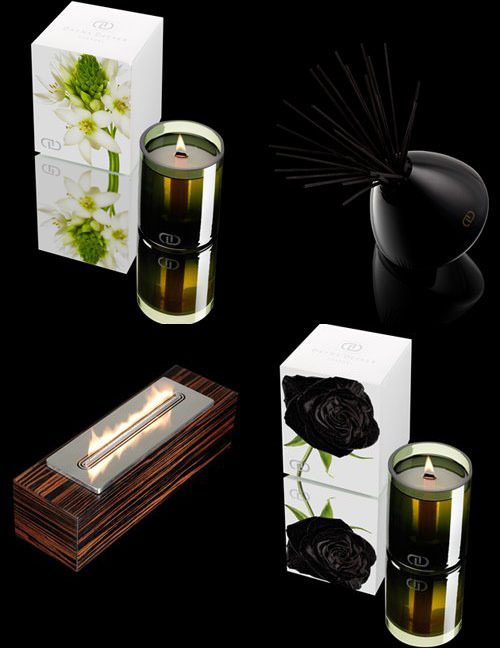 Some lovely images from the Cabbages & Roses A/W collection. If you like the shabby chic look, you'll adore their home catalogue too. I received some beautiful cashmere wrist-warmers from my friend Laura a few weeks ago and am officially obsessed. If you don't have a Laura of your very own, I really like these ones from Etsy-seller Jessica Rose too. 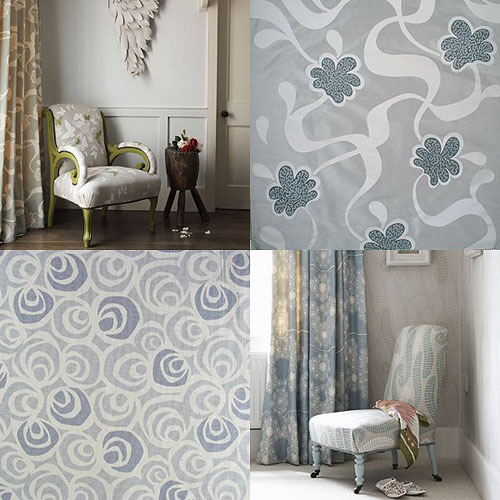 I very much like the fabrics and wallpapers from Rapture & Wright. 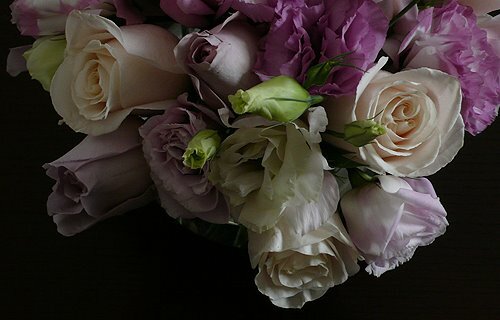 Right now, my whole apartment smells of these roses. The part of my brain that lives in the countryside wants to run around in Brora clothes (oooh Toast clothes too) and wear wellies and keep chickens. If I was a town planner, I'd dedicate my life to reconciling people's city versus country schizophrenia. Yes, my dears, I would build utopia. Years ago, I had this thing where I would photograph my bed every morning when I got up. I just found the roll of film tonight; had forgotten completely about it. I wrote about 4,000 words today. And they're good words. The best writing day I've had in an age. It all happened in this perfect park and now I'm superstitious about going there and dreading when the days will be too cold to sit under the trees and write. On an obliquely related topic, somebody sent me this video on Friday. I crack up at "all fecund in its nuttiness" every single time. (Though, I should warn you not to watch if there are little ones within earshot, unless you want to raise a cast of Roddy Doyle characters). 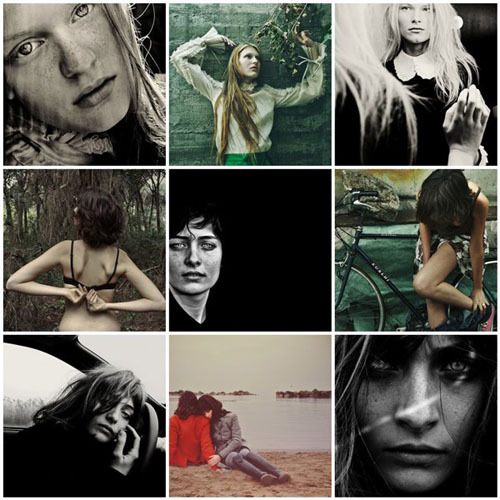 I am in love with Frederico Erra's Flickr. It's Thanksgiving weekend here in Canada. And if today's weather is anything to go by, it will be a perfect weekend for moseying around and doing not one iota of anything resembling work. I was feeling all romantic this evening and went for a walk, kicking leaves about and marveling at the colour of conkers (I'm pretty sure people don't call them conkers here, but we do in Ireland). On the way home, I bought a big bag of red pears and had two for dinner. I really do wish autumn could last forever. I'm thankful for all these simple pleasures and for my seeming streak of happy accidents. For living in Toronto, a city I love more and more. And, very much, for you, who read all my ill sayings and seeings. 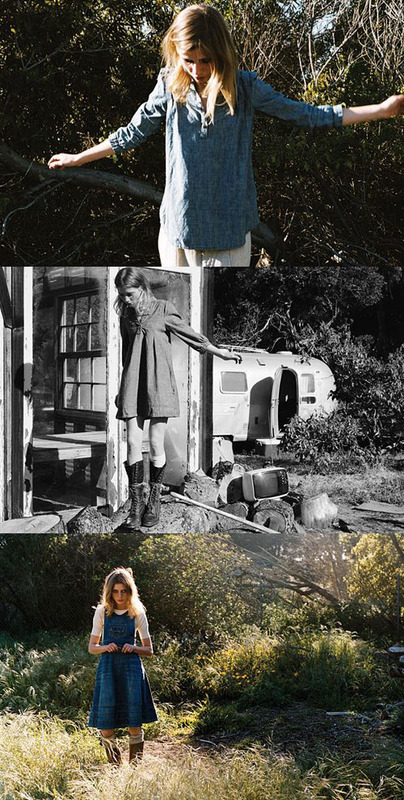 I adore the photo shoot for the F'08 Current / Elliott collection. 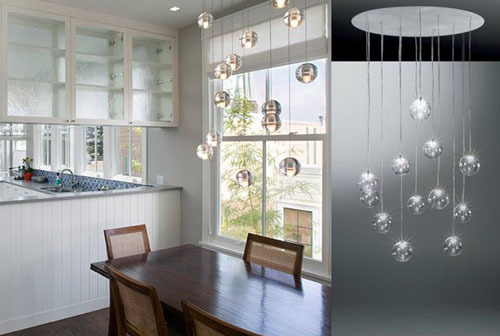 I saw this image on Remodelista a while ago and loved the spherical lights in the kitchen. Found these here this evening. Not sure they're the exact same ones, but aren't they fabulous? I just listened to this on the Paris Review. I am always surprised by writer's voices. Am reassured when they stumble or stutter. Feel better acquainted with their work, even if I know it already by heart. I love this blouse by Cynthia Rowley. Isn't it darling? 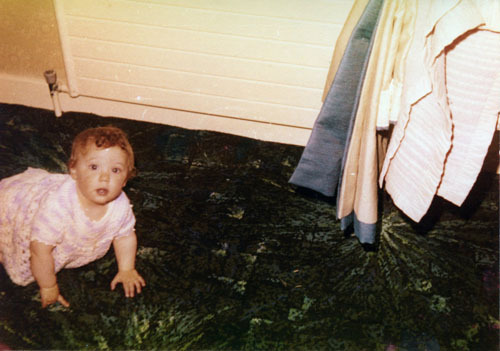 I also spent some time today browsing photo albums and scanned some photos from my childhood. Mum had a special knack for framing photographs, typified here. I love seeing us peeking in the side of a shot. It makes me laugh every time. Nice carpet too. I stayed home today - have caught cold. Not well enough to do anything, not sick enough to be in bed... boring day. 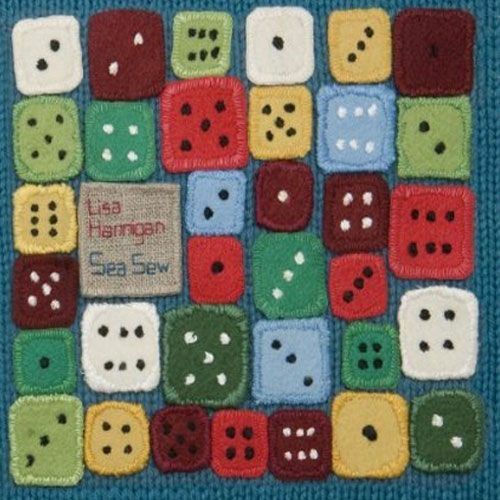 I did manage to download and listen to Lisa Hannigan's new album Sea Sew. I wish she was stopping by Toronto on her tour... she seems to be hitting everywhere else. I'm sitting at my desk, which faces the window, writing. I always keep one eye on the street. There's a regular dog walker with a basset hound who waves at me, though I don't know him. Just now, I saw a man and woman running towards each other. When they met - directly in my sightline - he swept her up and hugged her. It was a movie moment. I felt like Carver in that poem I posted last week. Image via. This is fun! From The Scoop... as also seen on many blogs this week, too many to name. I went for an epic stroll today. It's full-on Fall and everything outside is making me happy. 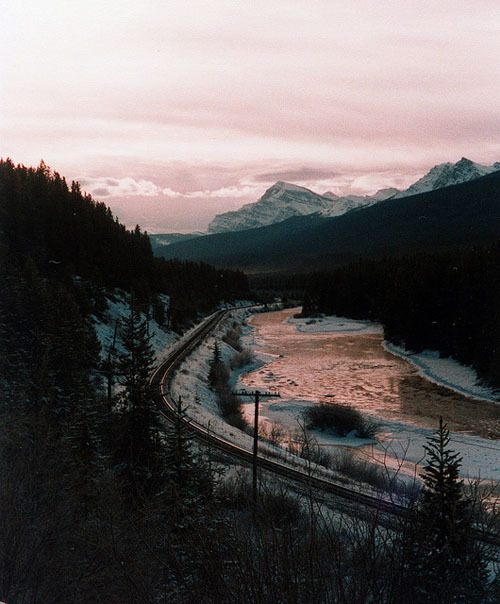 I stayed indoors this evening long enough to scan and Flickr some old photos from my time in Alberta. I fell hard for the mountains the first time I saw them. 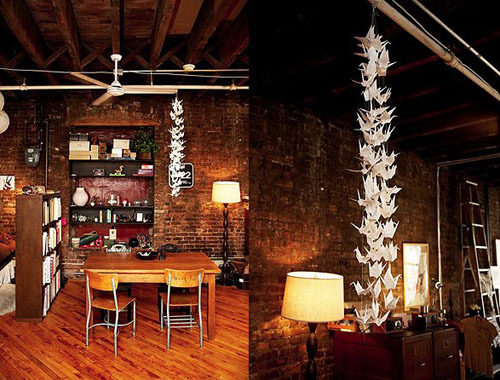 I love, love, love making paper cranes (here's how, if you haven't before). And I absolutely adore them displayed en masse as a crowded mobile. 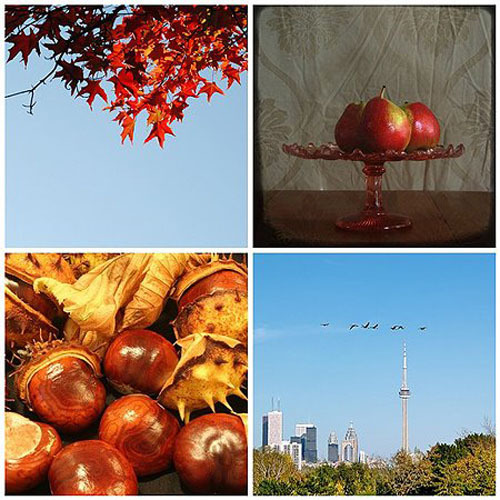 These images are from The Selby. Now.. where could I hang this? There's something about the change of the seasons that always makes me pine for home. Homesickness comes out of the blue, even after 5 years.